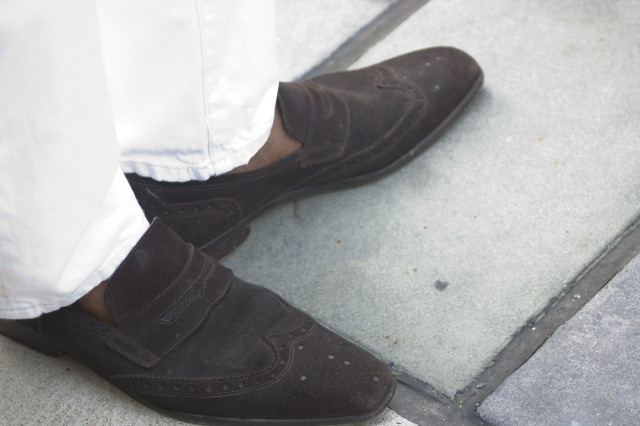 A nice suede loafer is very versatile. As you can see pairing them with a pair of white jeans really grounds the look. You will notice that I am going sockless in these photos. Personally, I prefer to go sockless in the summer because I like the look and it is very comfortable. 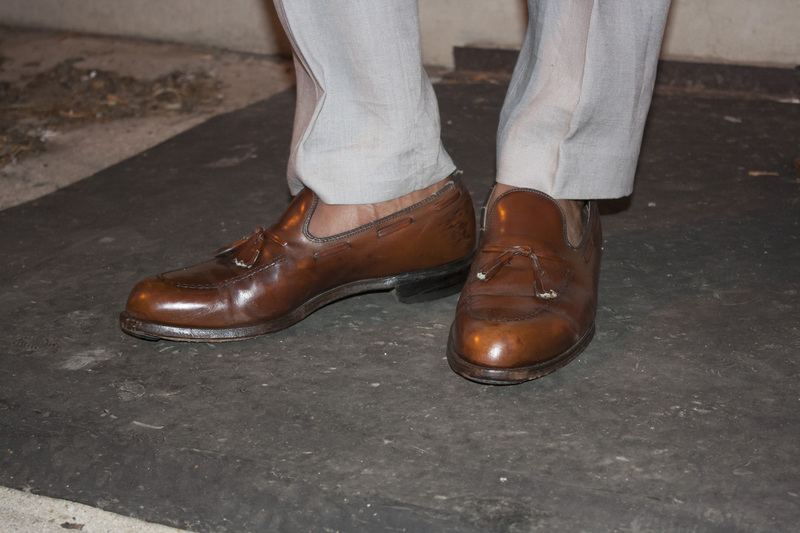 Loafers “fit” the sockless style well because they tend to be a form-fitting style of shoe than a lace up. With loafers being more form-fitted, you will not have to worry about friction against your skin because their will be no movement. Oxblood colored leather tassel loafers are becoming the most popular style of shoe on the market. The deep red color mixes well with grey, blue, denim and khaki so these are definitely a great addition to your wardrobe. Leather loafers work very well with suits, so if you office environment is relaxed enough (atleast during the summer) you can still go sockless and not seem unprofessional. 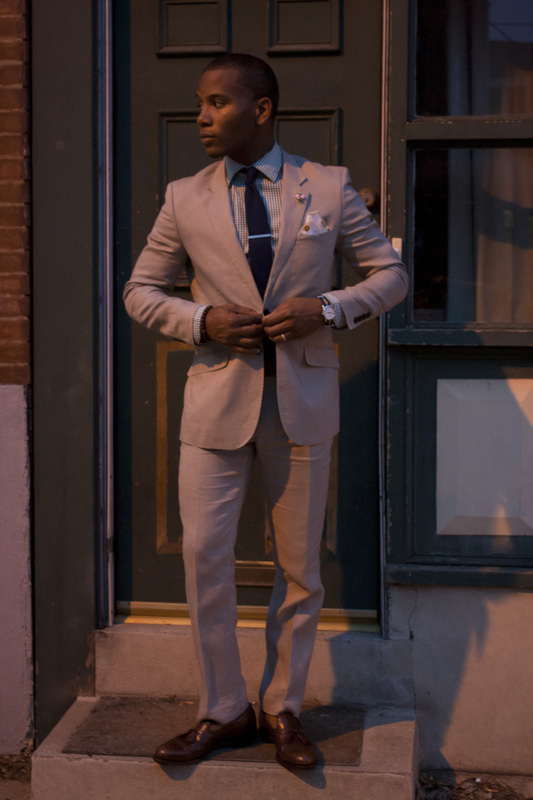 Remember, if you are going to wear a linen suit expect the sleeves and legs to wrinkle (that is the one down fall of linen). 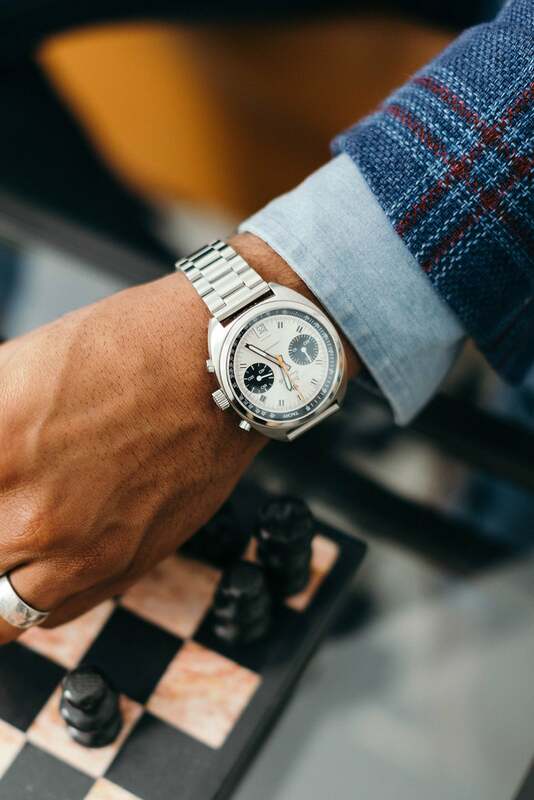 On the bright side with the extreme heat that we’ve been having on the east coast, a linen suit will keep you cool during the day and the night. With this particular look I went with a tan leather loafer to keep with the light summer feel of this particular outfit. If you want to make a statement that will never go out of style, take a pair of tan leather loafers and match them up with a navy suit. The colors of tan and blue will pop against each other. During this summer, if you have any weddings on the books, you can pull off a look similar to this with a tan leather loafer. The look will say, “this guys knows how to dress well in the summer and his shoes are on point with that complimentary summer color”. the frozen yogurt picture is by far my fav ! need me some loafers too! Plus that frozen yogurt was damn good too. Great photos – excellent attention to fit and detail. 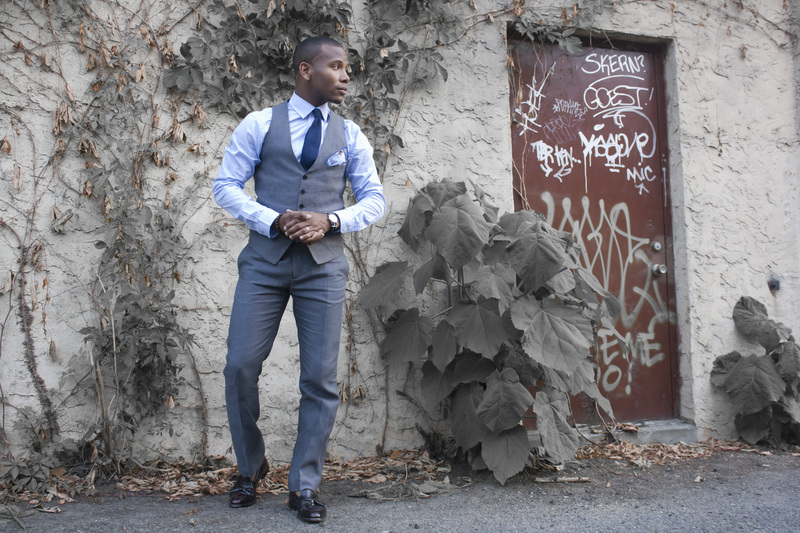 What are your thoughts on wearing a suit jacket and vest without the matching trousers? I see you do that in the top set with the white denim. Do you feel there are rules to wearing suit jackets as odd jackets? – Remember that the fit is key. Keep the clothes tailored. You killed it on this post! This is up there with some of your best work. 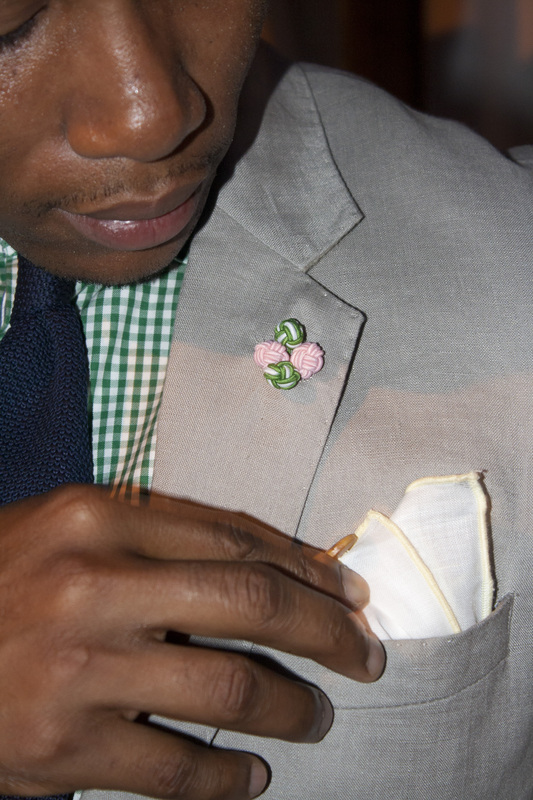 Any chance you can give us readers a tutorial on making lapel flowers with silk knots? Continue your style-forward thinking. Thanks for the support. I will shoot a how to video for making the Lapel Flower with Silk knots. Thanks for continuing to stick with the site. It is such a pleasure to experience this site. Your passion for the joy of dressing is wonderful. You are a prince of fashion. Thank you for sharing. Thank you very much for all of the kind words. really appreciate the fact that you showcase somewhat more affordable fashion that is within reach of the man on this street whilst at the same time not sacrificing any sartorial swagger…kudos.. 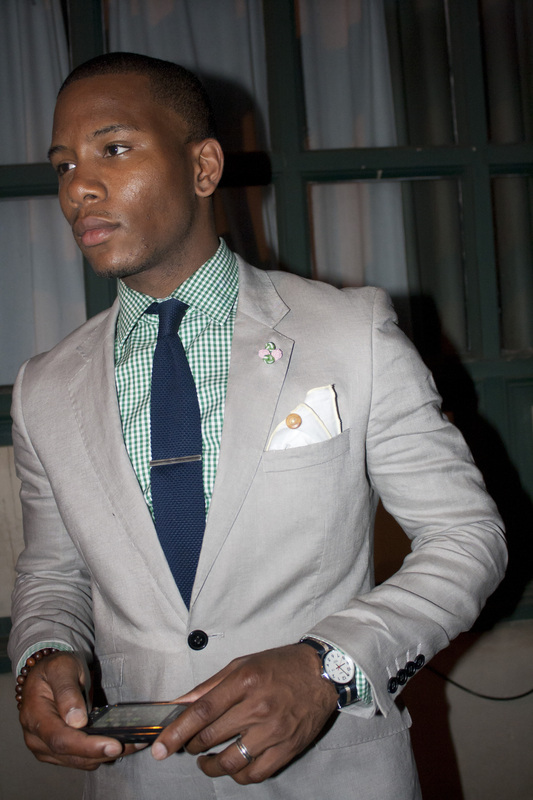 I think it is important to showcase that style doesnt have be synonymous with money (expensiveness to be exact). Your sense style is impeccable! First I would like to say, thank you for reading. Second, I would like to say thank you for the compliment. I try to do what I can with my own style and if people really like it thats a plus. Love it, I was surprised at how well the white pants came together with the grey jacket and vest. H&M seems to hit it right more often than any other off the rack company right now. Great article! Thanks for stopping by. It is great that pulling stuff right off of the rack from H&M is available for me. Since I am wide n the shoulders but a bit slimmer in the waist, the European cuts are perfect for me. The white pants were a steal from Target, believe it or not by Converse. Sabir, I’m going to have to enlist you to take me shopping! Now I have to go buy some loafers. Feel free to contact via email styleexaminersabir@gmail.com and I can help you out. i just started this blog to share about style with going into expansiveness as you say , i really appreciate your style and all peace man. Greetings from the US. Thanks for visiting my site and taking interest in my pictures. I hope all is well and continue to come back. Have you ever tried J Adler loafers? They have a variety of nice ones to choose from. I bought my husband bespoke loafers. He loves the custom fit!